Songwriter, bandleader, social critic, poet, and humorist all apply to The Kinks front man Ray Davies. Unlike other British Invasion-era bandleaders, he didn't seem comfortable as a front man. He wasn't cute like the guys in The Beatles or cocky like Jagger from the Stones. The band's sound was also different. Much less rooted in American music, The Kinks had a more overtly English sound. Davies often sang in a shy, insecure voice over some of the wildest and rawest music anybody had ever heard. Davies' songwriting rapidly developed and soon enough his anthems of unrequited love transformed into beautiful pop songs teaming with vivid imagery. Unfortunately, during those key years of 1965 through 1969, The Kinks were not permitted to enter the United States. Do to a union dispute that caused this sad state of affairs, The Kinks never got the American exposure so critical to commercial success at that time. This prevented the group from the attention they so richly deserved. Regardless, The Kinks were crafting some of the most beautiful rock songs ever recorded during these years, many featuring melodies that were as impressive as anything being recorded at the time. Just as the American banishment was lifted, the band hit big with the sexually ambiguous "Lola" and an album that attacked the music industry and record companies at a time when the Punk generation was still in diapers. The Kinks entered the 1970s with the loose, drunken approach adopted by many groups of the era, but unlike contemporaries like the Faces, Davies lyrics often revealed a more mature confusion and sadness amidst his hedonistic fun. In 1972, The Kink's released the double album Everybody's in Show-Biz, consisting of half studio tracks and half live recordings. The studio recordings were thematically focused on an Englishmen's adventures on the American road, while the live portion featured The Kinks, augmented by a horn section, enjoying themselves onstage, a real-time representation of the life described in the studio recordings. The band, with the horn section in tow, returned to America in the latter part of 1972 to promote the album. 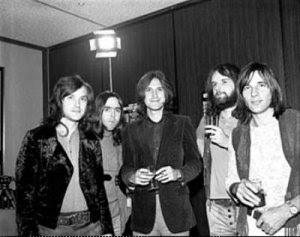 This concert, recorded at the Orpheum in Boston captures The Kinks in loose, but fine form, with Davies joking with the audience in a stage persona that is both satirical and highly entertaining. In addition to several classic hits, this performance features a wealth of material from Everybody's In Show-biz, that clearly showcase Ray Davies' weariness, cynicism and humor about life as a rock 'n' roll star. The recording begins with the road rocker, "Here Comes Yet Another Day," followed by "Acute Schizophrenia Paranoia Blues," a thoroughly engaging romp down the path to self-destruction, featuring New Orleans style horn arrangements. The barrelhouse rocker, "Alcohol," also complete with horn arrangements, features a particularly humorous prelude from Ray, before the group launches into a celebration of drunkenness. They conclude the new material with another powerful rocker, "Skin And Bone," increasing the tempo, volume and power of the original. After taunting the audience with a tease of "You Really Got Me," the set concludes with one of the first songs the group ever played, a rocking cover of "Good Golly Miss Molly," featuring Dave on lead vocals, leaving the Boston audience clamoring for more. The Kinks oblige and when they return to the stage for an encore, they deliver a raw double dose of the group's earliest hits "You Really Got Me" and "All Day And All Of The Night." This sends the audience into a frenzy of applause that doesn't let up until they return again, this time for an audience sing-a-long version of "Lola" followed by a pile-driving take on "Victoria" to end the night. You just made my week, my month, my year!! I have such a deep and long-standing appreciation and respect for the Kinks, and having seen this offered here, I turn some of that respect to you. A million thanks, Hal, for your generosity. You've made at least one fan a very, very happy fan. Do you happen to have any other obscure lossless Kinks boots? Any chance you might have a lossless copy of the Nov. 1969 live at the Fillmore West boot? You're welcome. I will try and upload more shows in FLAC. Once I post the rest of my sharebee files,I will switch to Multiupload and try and see how uploading FLAC will work. I am most appreciative, Hal . . . I recognize the extra effort it takes to upload FLAC. Thank you. Looking forward to seeing more.